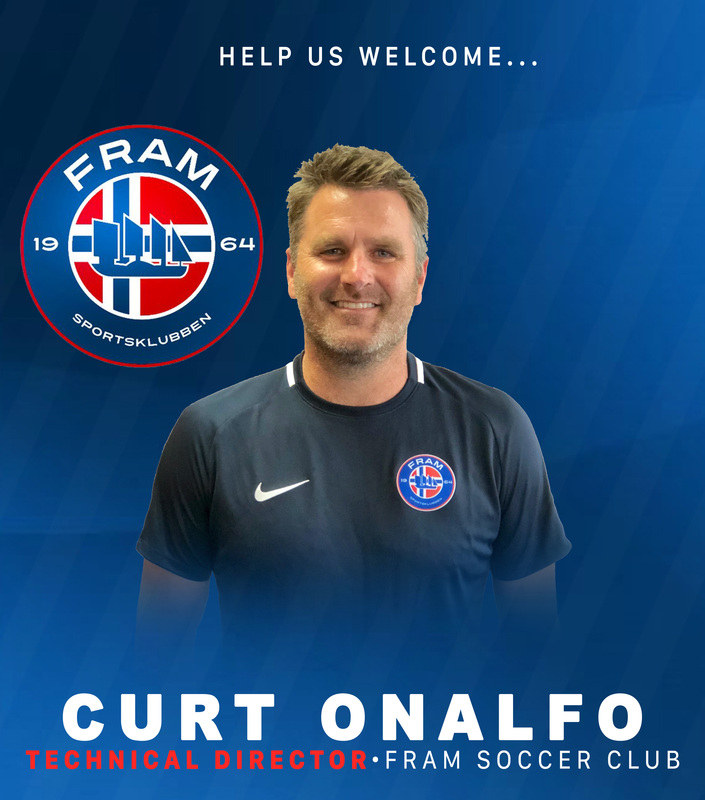 PALOS VERDES, CA — FRAM Soccer Club announces Curt Onalfo as their new Technical Director. A position new to the franchise, Onalfo’s duties encompass oversight of club structure, player and program development, coaching curriculum and overall club management. Onalfo’s coaching résumé is extensive, having served as the head coach of three MLS clubs: Kansas City Wizards, D.C. United and the LA Galaxy. Throughout his career, Onalfo has maintained a strong reputation for developing players and has ran several successful youth soccer development academies across the country. FRAM is thrilled to have Onalfo’s strategic vision and inclusive leadership style within the club. “Curt is known for his ability to not just identify and foster talent, but also for his creative approach in implementing sustainable infrastructure within organizations that directly translates to success for the players and families, coaches, and administrators alike. We’re tremendously grateful to have him on board”, said Pat Mason, President of FRAM. “I’ve been fortunate to have a robust and diverse career in soccer — from my leadership as a youth player on the U.S National Team in the 80’s, to my victory over cancer in ’93, the countless championships won at every level, to my tenure as a pioneer in the MLS and abroad, I remain humbled and exponentially passionate about building self- confidence through soccer. There’s no better place I can think of to pick up the baton, than in the community myself and my family are proud to call our home. Thank you for welcoming me into the FRAMily!" FRAM, the premier Palos Verdes based soccer club, is one of the oldest soccer programs in the country, and boasts a membership of over 600 players and roughly 50 teams. Established in 1964, FRAM has a rich and documented history of developing high-level athletes, supportive matriculation pipelines, and competitive play at the youth and adult levels undergirded by a culture that promotes leadership and community involvement. Most recently, FRAM announced it is set to join the prestigious Super Y League as one of five founding members of the league’s new Southwest Division (USL). Undoubtedly, a Director of Onalfo’s caliber joining a rooted and respected club like FRAM is the kind of partnership sure to send shockwaves of excitement throughout the regional soccer community. With momentum this positive, amidst an ever-changing soccer landscape, FRAM Soccer Club is confirming its namesake, moving FORWARD, with excellence, and shows no signs of turning back!